Welcome to Forecast! 🙌 If you're reading this, you're probably either a Collaborator yourself, or maybe just interested in how Forecast looks in the eyes of a Collaborator. We strive to make Forecast as easy as possible for any type of user. This article will help you get started. After signing in to Forecast as a collaborator, the first view you get introduced to is your Upcoming Work. Upcoming Work is a simple list of all the cards assigned to you. Cards are tasks with all of their details attached inside of them. 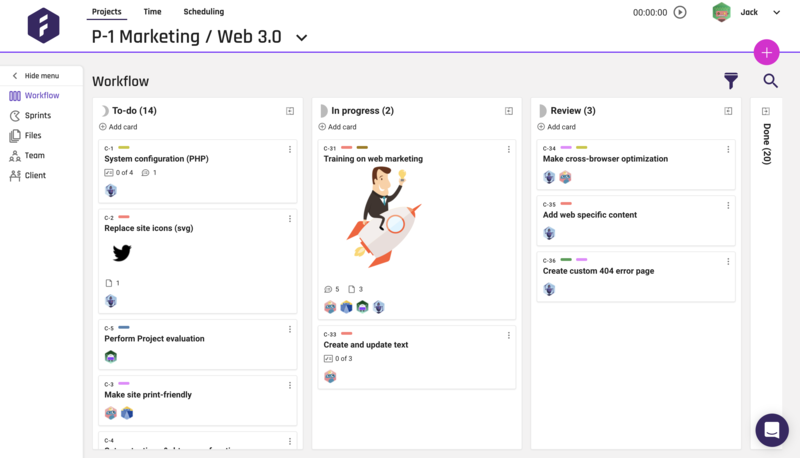 Cards can contain a description, comments, files, to-dos (or subtasks), and labels. Additionally, they can have a start date, a deadline, assigned people, and time reported on the card. You get back to your Upcoming Work by clicking the logo at the top left. If you got invited to Forecast as a collaborator, you probably already have one or several projects assigned to you in the Projects tab. Projects is where all the fun stuff is going on. It's a collaborative environment for making things happen. The first view you get when first entering a project is the Workflow. Workflow is where all cards live. Cards live in columns. Columns have a certain phase attached to them, i.e. to-do, in progress, done. You can have several 'in progress' columns, but only one to-do and one done column. As work progresses, cards naturally follow a flow from left to right. This is the Workflow. Depending on how you work, you can choose to either report time on cards, or take a step back and just report time on projects. You probably have a company policy on how to do this best. Just above the sheet, you can choose between two views, Viewing allocations or Viewing cards. This is basically two different zoom levels. Allocations shows which projects you're allocated for, and Cards shows you which cards you're assigned to within those projects. At the top right of Forecast, we have three global elements. Your personal menu, named after you, the universal Create button, and the Timer. Your personal menu includes My Profile for all of your personal settings, e.g. language, name, email, picture, skills, working hours, change password, personal notifications, etc. It includes a link to the Help Center, a button to view keyboard Shortcuts, and a button to Log out of Forecast. The Create button just below lets you create cards on projects. And, finally the Timer lets you start a simple stopwatch, to afterwards report the time directly on a card. The timer works across Web and Mobile Apps, which means you can start the timer on your laptop, stop it again on your phone, and vice versa. In descriptions or comments on a card, use the @-mention method to notify a colleague about your comment, e.g. @jack. Jack will then receive an email with a link to the card. Using a calendar outside of Forecast? Thought so. Ask your manager (with Admin permission) to enable the Calendar integration in Forecast. It only takes a few seconds. This generates a unique iCal link for each team member. You can use this link to make all of your cards, with deadlines, show up directly in your calendar app, e.g. Google Calendar or Outlook. If you ever have a question, the Help Center is available from your personal menu, and at your bottom right, you have the Live Chat functionality which brings you in contact with a Forecast employee as quick as possible.